It's rapidly become a widely discussed point of contention: the Confederate flag, which was designed by William T. Thompson, an American writer and editor, in 1863. After last month's shooting at a historic black church in Charleston, the South Carolina House of Representatives passed a bill Thursday to remove the Confederate flag from the South Carolina statehouse, and Governor. Nikki Haley signed the bill into law later that afternoon, saying that the flag would be lowered "with dignity." But at no point in history has the use of the flag itself ever been dignified, and that's according to the designer himself. (Update: It was actually William Porcher Miles, the man in charge of the flag committee in the provisional congress of the Confederacy, that designed the flag we see today. But this design was never formally adopted by the Confederacy, and instead persisted because Thompson adopted Miles' design in his Stainless Banner, which was enthusiastically accepted by the Confederates. However, despite it being Miles' design that we see today, the racist symbolism of the flag still stands. Meanwhile, Thompson's flag still flies on the grounds of the Alabama state capitol in Montgomery). Our idea is simply to combine the present battle flag with a pure white standard sheet; our southern cross, blue, on a red field, to take the place on the white flag that is occupied by the blue union in the old United States flag or the St. George's cross in the British flag. As a people, we are fighting to maintain the heaven ordained supremacy of the white man over the inferior or colored race; a white flag would thus be emblematic of our cause. ... Such a flag would be a suitable emblem of our young confederacy ... it would soon take rank among the proudest ensigns of the nations, and be hailed by the civilized world as THE WHITE MAN'S FLAG. After the Civil War, Thompson sided with the Democrats in opposing the Republican Party's effort to grant civil rights to black people in the South. So, to anyone who has argued about the flag's importance in "Southern heritage": It is, and was always supposed to be, a symbol of white supremacy. The flag was first flown from the South Carolina statehouse in 1962, during the Civil Rights Movement. In fact, that was just one year after Alabama Governor George Wallace raised the flag in his own state. As Syracuse University historian Jonathan Wilson points out, there is no circumventing Thompson's own explanation for what the flag stood for. 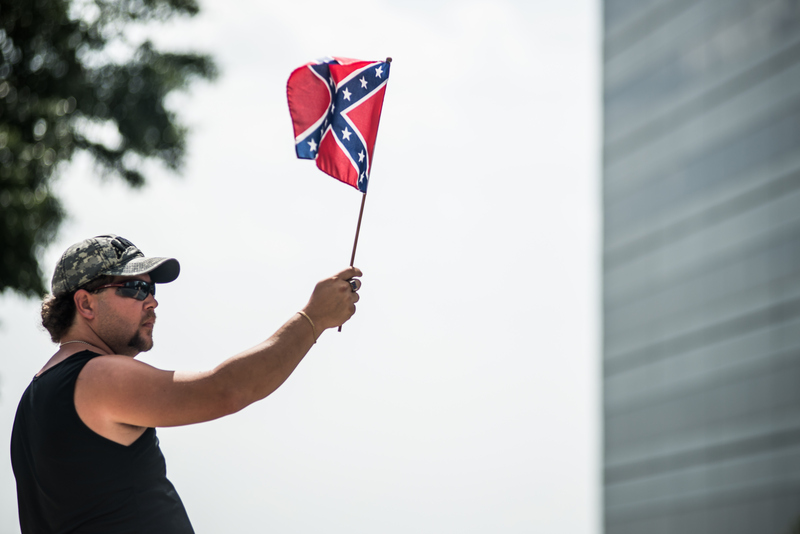 The "legacy" of the Confederate flag has always been one of systemic racism, oppression, and subjugation, and its own designer would not have denied that.